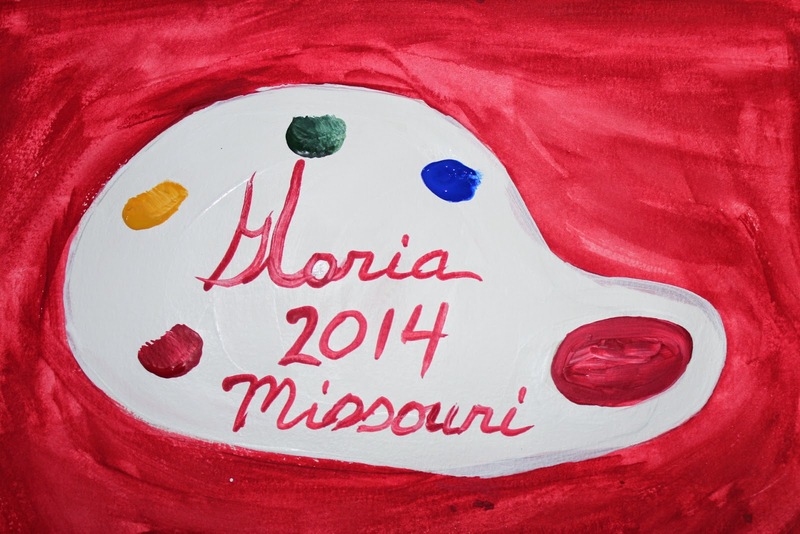 I, Gloria Poole, drew, painted, signed, photographed, uploaded all art to this blog. See copyright below sketches.
" 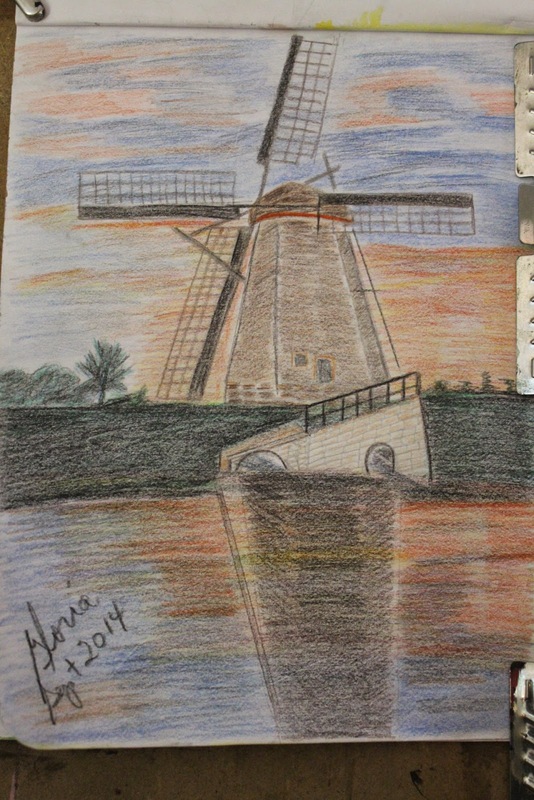 Windmill in polychrome" sketch by Gloria Poole of Missouri ; created by me on 22 Sept 2014 but uploaded today 26 Sept 2014 also by me Gloria. I drew this with polychrome pencils [which are not watercolour pencils] but sort of acrylic in a stick. I waited to add to blog while I thought on it some. I saw windmills when I visited Europe twice in the 1990's and I was fascinated by them. I much prefer the old-fashioned kind I sketched than those new pencil-skinny white pole with 3 blades new type. The reason I almost didn't add this is because I didn't think the river in front of the windmill, nor its shadow in the water looked right. I almost declared it a do-over without posting it but decided why not? When I repaint it maybe it will look better. Water is not easy to paint for anybody; and I keep trying. I , Gloria Poole, also drew, painted signed photographed and uploaded these other two sketches of windmills, by referring to photos of real places, then modifying them sort of to make it as I wanted it to look. Which is called "artistic license"-- artists can paint it anyway they like sort of idea. It is also posted on another blog of mine. 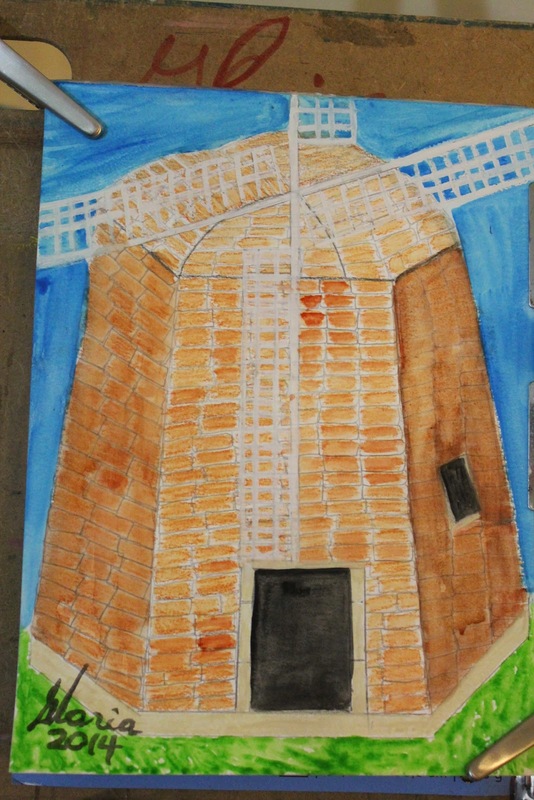 "Town Square windmill" sketch by Gloria Poole of Missouri yr 2013. This sketch is one I created of a windmill in the center of town. I was referring to a photo of a real town but I modified the windmill and the city houses and buildings behind it because I preferred red and green than the pastel colors they had on their buildings. 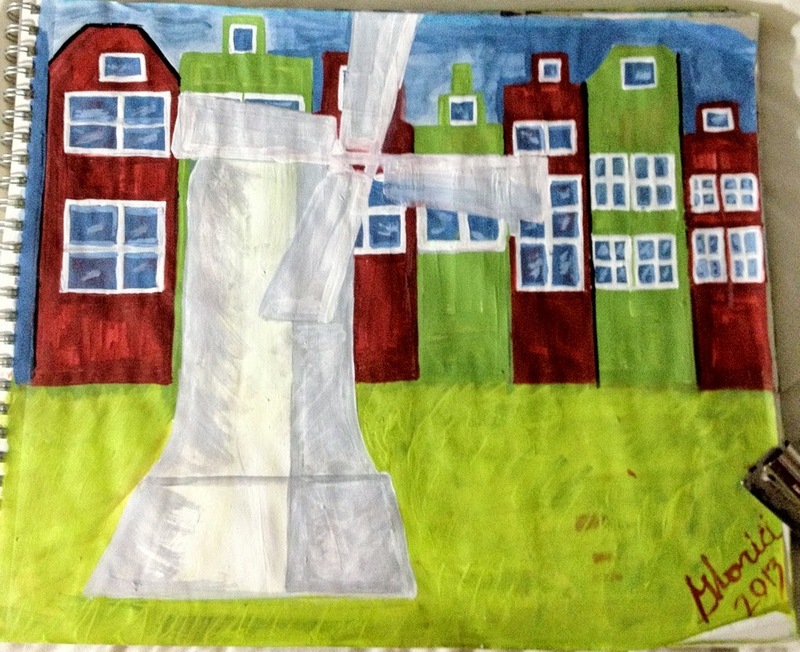 Also, I painted a large oil painting of a windmill years ago after I returned from Europe and it was stolen from me. I had stored it in a storage facility on St Simons Island Georgia when I lived there, but then moved from Georgia. It was in perspective to show me standing next to a windmill in Europe that towered over me. In fact, with my arm outstretched to try to touch the base of the windmill, I couldn't quite reach the top of the platform the windmill sat on. My signature I painted on a palette to make a sort of icon for my blogs. 26 Sept 2014: Copyright notice: this blog and all content on it is created by me and owned by me Gloria Poole residing in Missouri but born in the state of Georgia, and it is covered by U S copyright law. I, Gloria Poole, own all rights to this blog and to all content on it, all words, all photos, and all art represented by photos that I photographed. I have the actual, tangible art I created and photographed. This blog and or its individual posts may not be transferred to anyone anywhere,nor have domains forwarded to it that do not belong to me, nor be saved to disk, nor downloaded, nor printed at remote, nor copied, nor photo-copied [screen-captured] , nor in any way with any method be reproduced. I, Gloria Poole, own all rights to all words, art and photos I create with any method of technique or medium on any surface anywhere any location any reason or no reason, whether or not I photograph it on any camera, phone, etc, and whether or not I publicly display it anywhere. I have never signed a blanket waiver of my copyrights to art I have created and do not have an artist's rep [agent], nor literary agent to represent me, and never did. I drew, painted, signed, photographed and uploaded all art on this blog and on any blog of mine. I, Gloria Poole, am a white, Southern Baptist Christian, brown-haired woman, single-again, twice-divorced,natural mother of only two children who are grown daughters named Jennifer and Leigh, and also a republican, personhood promoter, prolife activist-blogger, photographer, artist in all mediums, poet, author, illustrator, cartoonist, writer, University of Georgia alumna, U S citizen born in the state of Georgia [but I lived in several places including New York, UK briefly, Nebraska, South Carolina, Colorado, Virginia, North Carolina], former TV producer,tweeter, Registered Nurse licensed in Missouri [but before that in Georgia, UK, other states], owner/writer for words that WORK, and Tapestry of LIFE, photographer, and citizen journo . Gloria Poole is my real, born with legal name and I resumed my full maiden name including my surname of Poole legally by Court order at the time of divorce from male DBP in Colorado in Oct, 2007 at Centennial, Colorado; and I also removed the Pappas name from my name forevermore at the time of final decree in Oct 2007 . I was glad to end that four year horrible marriage of multiple trauma and injuries to me caused by male DBP, [which I testified about in Court on several occasions ]. That second divorce is public record in the state of Colorado, and my first divorce is public record in the state of Georgia. I have created art regularly since 1991, and I had formal training in drawing and in mixing colors /paint and painting in oils and I post much of the art I create on blogs of mine. You can see some of that art on one of my name blogs at https://gloriapoole.blogspot.com and see the about me page of that blog for the list of art blogs I own and post art too, that are all different. . Copyright. Gloria Poole also known as Gloria on art I create and sign and in real life since it is my real, born with first name; and as Gloria Poole, RN, artist and on the web as : gloriapoole; gloria-poole; gloria.poole; artist-gloriapoole; @gloriapoole; @gloria_poole; gloria0817; gpoole817; Ms. Gloria Poole; Poole.Gloria; gloriapoole-paintings; cartooning-by-gloriapoole; photo-by-gloriapoole; gloriapoole.RN; gloriapooleRN at yahoo in which the RN is standard abbreviation for Registered Nurse, and other variations of my real. born with name of Gloria Poole, at my own, private apt in Missouri which is not shared with anyone, on 26 Sept 2014 at 4:03pm.